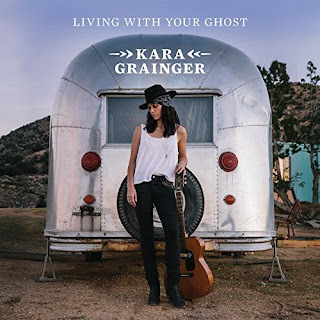 I just had the opportunity to review the most recent release, Living With Your Ghost, from Kara Grainger and it's solid. Opening with straight up rocker and title track, Living With Your Ghost, Kara Grainger leads on vocal with Anders Osborne on guitar, Ivan Neville on keys, J.J. Johnson on drums and Dave Monsey on bass. With it's steady rhythm, slick guitar solo and memorable melody, this is a certain radio track. Working My Way Back Home has a particularly intriguing drum rhythm and super slide from Osborne. Very nice. My favorite vocal track on the release is Nowhere To Be Found nicely showcasing Grainger's emotional delivery, emphasized by Neville's organ work and warm slide work of Osborne. Spirited track, You're In New Orleans features a vocal duet by Osborne and Grainger. Lightly salted with guitar, drums and keys and with the injection of the Texas Horns, excellent. Funky, Groove Train really gets a great groove going with a solid bass line by Monsey and super punctuation by the Texas Horns. Grainger's sassy vocals, a hot sax solo and nicely executed guitar riffs by Osborne make this my favorite on the release. Reason To My Verse has a really soothing, John Hiatt feel, making it another strong entry to this release. Very nice. Wrapping the release is Freedom Song with a strong drums line and sonic guitar work surrounding the bluesy vocals of Grainger. This is an unusual but particularly cool track and an excellent closer for a cool release.